Growing from military roots, the American flag has long been a part of drum corps heritage. 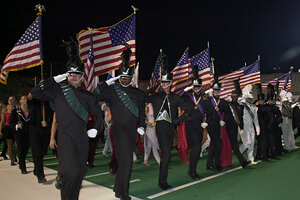 Displaying the colors used to be a required element of every corps' competitive performance, and there was even a time that Drum Corps International rules mandated that no flag could be higher than the American flag on the field. That meant color guard tosses above the Stars and Stripes could be subject to a penalty! While by the 1980s displaying the flag had become optional, carrying the colors onto the field is still a drum corps tradition held onto today, most notably as part of the DCI World Championship Finals. During the ceremonial finale to the week-long series of Championship events, each corps will display the flag on the front sideline with an honor guard. As we take today, June 14, to celebrate Flag Day, check out this photo gallery of corps members proudly flying Old Glory. View this photo gallery.